After months of dead ends, the Winchesters finally make some headway in their quest to remove the Mark of Cain. Well, Cain was a complete badass in the end. He definitely left an impression in his previous appearance, but he was completely awesome to watch from the very start of “The Executioner’s Song.” I’m not sure which was cooler: his visit to the prison at the start, his little “project” that Castiel stumbled upon or his confrontation with Dean. Every one of these moments built him up into an even more imposing adversary, with the only disappointment being his inevitable death. Even with that slight disappointment, this was a rollicking superb episode of Supernatural. I’ve been crying out for an episode focused on the Mark that reunited all of our main players, and that’s exactly what we got here. Castiel was in full heaven’s warrior mode as he tortured demons to get Cain’s location, and Crowley quickly brushed aside his mommy issues to help the Winchesters… and himself. It looks like we’re going to see a shift in the Crowley/Winchesters dynamic now, with the King of Hell likely feeling very betrayed by “Moose and Squirrel.” Crowley has been a bit too soft recently, something that Rowena calls him out on here. He knows that his mother has been manipulating him, but I have a feeling he just doesn’t care right now. I’m hoping that we’ll see him return to being the old, ruthless Crowley that we love and maybe turn the tables on his mother along the way. So, back to Cain! Timothy Omundson was absolutely terrific in the role of the “Father of Murder.” The scenes I mentioned at the top of this review were excellent displays of both Omundson’s talent and Cain’s sheer menace. I especially loved that Cain was on a mission to kill every last descendant of his, which would eventually amount to thousands upon thousands. With his first victim of the episode being a death row inmate, I figured he was just targeting bad people to satiate the Mark. As it turns out though, he was willing to kill men, women and children, no matter if they were completely innocent. The big Dean vs. Cain smackdown was the highlight of the episode, but not just because of the epic fight involved. The thing that stuck with me the most was Cain’s words of warning to Dean. I felt a real feeling of dread when Cain said that Dean was living his life in reverse, and that Crowley, Castiel and finally Sam would all die at Dean’s hands. This of course sounds impossible, but when you think about it, is it really so hard to believe? Dean may have been able to hand over the First Blade after dealing with Cain, but he’s still a ticking time bomb. With or without the First Blade, he will snap again, and there may be no coming back from it. Dean managed to kill Cain and hand over the blade, but he and Sam both know that he’s in big trouble. “The Executioner’s Song” was the episode many of us have been waiting for, with the gang all back together and the central plotline tackled head on—and it really didn’t disappoint. 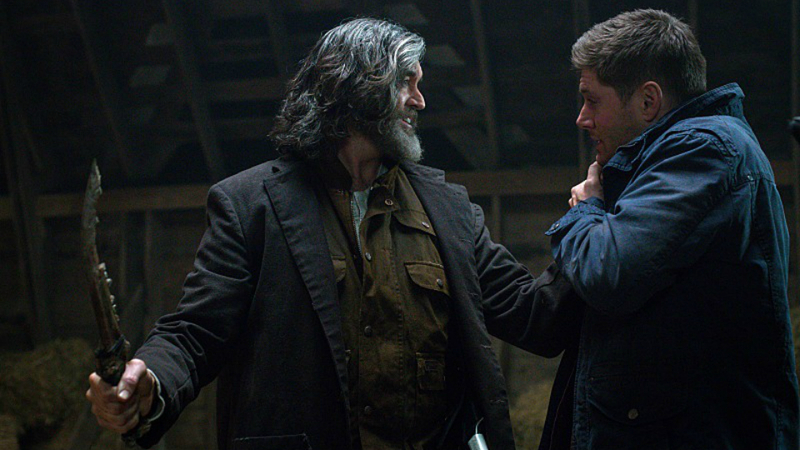 Guest star Timothy Omundson brought a cracking performance to the table for Cain’s final appearance (well, as final as anything can be on Supernatural), and now an uncertain path lies ahead for the Winchesters. They had been searching in vain for a cure, and just last week Dean had decided he didn’t need one. Killing Cain has shown both Dean and Sam that trying to control the Mark just isn’t a viable option. Cain’s dead, Crowley’s off their friends list and Castiel doesn’t know what to do, so the brother’s really are left without any sort of plan right now. There are still quite a few episodes left this season, and I’m starting to think that the Winchesters may have to take some rather drastic actions to solve this predicament. How much of what Cain said will turn out to be true? Do you think it’s possible that Dean will end up killing any of the three people he mentioned? Tweet your thoughts @OldSnake24 or let me know in the comments below. Also, be sure to follow us @YouNerded.